United Cities and Local Governments Middle East and West Asia Section (UCLG-MEWA), together with Foundation for Political, Economic and Social Research (SETA) organized a workshop titled ‘’Opening Channels’’ that gathered several local governments around the question of culture-art. Beylikdüzü Municipality, Büyükçekmece Municipality, Diyarbakır Metropolitan Municipality, Union of Municipalities of Southern Anatolia (GABB), İpekyolu Municipality, İstanbul Metropolitan Municipality, Kadıköy Municipality, Malatya Metropolitan Municipality, Union of Turkish World Municipalities (TDBB), Union of Municipalities of Turkey (TBB), Yunus Emre Institute and Zeytinburnu Municipality from Turkey; and Nablus Municipality from Palestine; Oyoun Ghozlan Municipality from Lebanon participated in the workshop which was held in the headquarters of SETA, in Eyüp, İstanbul, Turkey. Beside the representatives of the local governments, Ahmet Zeydan, journalist from Libya and Mevlana İdris, author from Turkey embellished the meeting with their speeches. The first session in the morning was composed of the presentations giving information about the events of the participants. The two primary goals of the workshop were to ensure exchange of information and to open communication channels between local governments, as can be understood from the title. In this regard, in the second session Edibe Şahin who talked on behalf of GABB and Selin Burçak Ünal from Büyükçekmece Municipality drew the attention on interesting topics. Edibe Şahin, who was the Mayor of Tunceli at that time, talked about the cultural exchange that they had established between Tunceli Municipality from Turkey and Guernica Municipality from Spain in 2012. Furthermore, Selin Burçak Ünal mentioned their activity that is gathering people from Turkey and Greece who experienced the exchange of population in the past, and that takes place in Büyükçekmece where most of the population consists of exchanged people. Raja Taher, from Nablus Municipality, Palestine, mentioned the resistance culture that they have developed against the occupation and how their struggling against the ownage of their cultural values by Israel. Mevlana İdris who took the floor in the first two sessions, approached to the topics in a more critical perspective. After his speeches, local government representatives offered solutions to his perspective. From time to time local government representatives shared their problems with their colleagues. 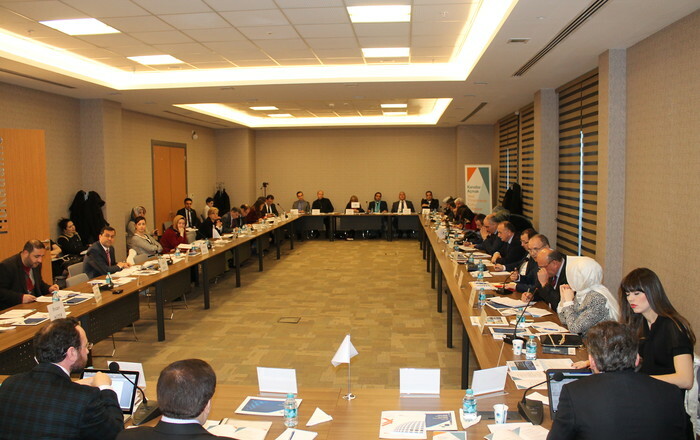 The workshop that UCLG-MEWA and SETA organized in cooperation was warmly welcomed by the participants, several demands were voiced and the desire to organize the second phase of the workshop was stated.